Dilute 1 part E-Z Gone to 5-10 parts water depending on condition of surface to be cleaned. Rinse with water. Dilute one part E-Z Gone to 5-10 parts water. Dilute 1 part E-Z Gone to 10-20 parts water depending on condition of surface to be cleaned. May be used as a pre-soak before steam or hot tank cleaning. Before using on a painted surface, test on an inconspicuous area. 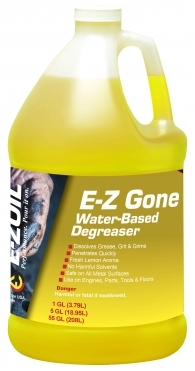 The best-concentrated water-based degreaser, E-Z GONE uses a high-performance formula for light to medium duty industrial grease removal without the use of harsh chemical components. For light to medium-duty industrial degreasing performance, reach for E-Z GONE!